18 Apr 2017 – This paper is one of many proposals for a systemic alternative we have published or will be publishing here at the Next System Project. We have commissioned these papers in order to facilitate an informed and comprehensive discussion of “new systems,” and as part of this effort, we have also created a comparative framework which provides a basis for evaluating system proposals according to a common set of criteria. 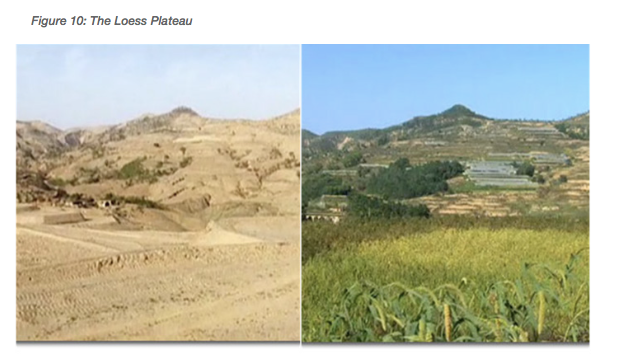 Degraded and Threatened Ecosystems. We currently extract resources 60 percent more rapidly than nature’s capacity to replenish them, meaning that we would need 1.6 earths to sustain our current annual consumption rates.2 If we don’t change we will be gobbling up the equivalent of two earths annually by 2030. Ten years ago, 50 percent of the planet’s ecosystems were deemed threatened.3Once ecosystems are degraded beyond their “tipping points,” their resilience is lost—they can no longer maintain their essential structure and functions. Their services in support of life—including the sequestration of carbon—are lost. The communications revolution, coupled with deregulation of the financial sector, has given rise to a worldwide casino of speculative finance ten times the value of global gross domestic product (GDP) and almost completely dissociated from the real economy or the transition challenges we face. Adding to this conundrum is the fact that governments have given over their sovereignty to create debt free money. Private banks issue 95 to 97 percent of created every time a bank issues a loan. And we the borrowers, private and public, pay the bank compound interest for the privilege, at huge cost. German researchers have estimated that 35 percent of the costs of goods and services are the embedded cost of compound interest working its way across the multitude of supply chains in the economy.5 Moreover, they estimated $600 million per day in interest payments flows from the bottom 80 percent of the population (wealthwise) to the top 10 percent. Diversity: A resilient world would promote and sustain diversity in all forms (biological, landscape, social, and economic). Diversity is a major source of future options and thus of a system’s capacity to respond to change and disturbance in different ways. Resilient systems would celebrate and encourage diversity, instead of homogenization. Modularity: A resilient world would be made up of components that can operate and be modified independently of the rest. In resilient systems, everything is not necessarily connected to everything else. 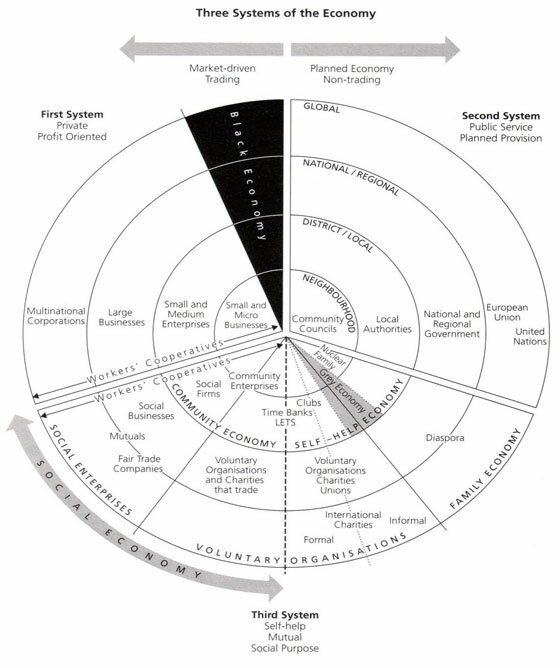 Overly connected systems are susceptible to shocks that are rapidly transmitted throughout the system: witness the recent global financialcial crisis. The modularity of a resilient system enables it to mitigate or absorb the repercussions of disaster. 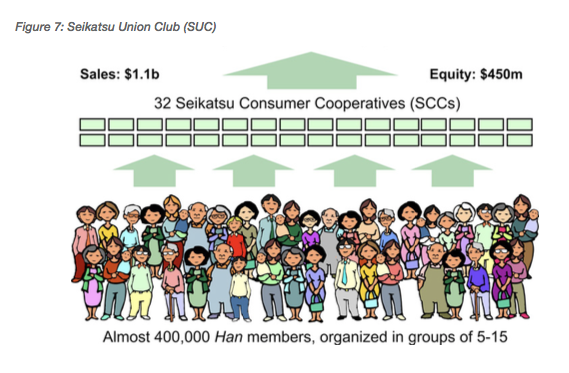 Social Capital: A resilient world would promote trust, well-developed social networks, and leadership. 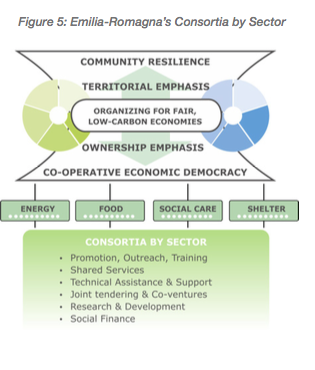 The resilience of social-ecological systems is rooted in the capacity of people to respond effectively to challenges together, not separately. In other words, trust, strong networks, and leadership are critically important. Innovation: A resilient world would place an emphasis on learning, experimentation, locally developed rules, and embracing change. Resisting change is counterproductive in a resilient system. Instead, by offering help to those who are willing to change, the system fosters innovation. When events begin to erode rigid connections and behaviors, innovation opens up new opportunities and resources for creative adaptation. Overlap: A resilient world would have institutions whose governing structures include “redundancy.” It would also have a mix of overlapping common and private property rights, increasing access to land. Redundancy in institutions increases the diversity of responses possible in the face of disturbance and crisis. As a result, overall flexibility and the effectiveness of adaptation increase. By contrast, top-down, centralized, “efficient” structures with no redundancy tend to fail when faced with change outside the scope of their mandate. Similarly, exclusive private property rights are at the heart of many strategies of resource use. Resilience increases when wider access and a mix of common and private property rights compromise this exclusivity. Tight Feedback Loops: A resilient world would possess tight feedback loops (but not too tight). 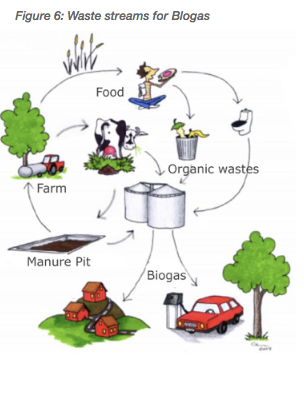 Feedback loops refer to the ommunication flow within a system. Information about the impact of a particular process or event is returned to the system to enable it to correct itself next time. Resilience is characterized by focused effort to maintain, or tighten, the strength of feedbacks so we can detect thresholds before we cross them. Ecosystem Services: A resilient world would consider and assess all the ecosystem services that the market economy currently disregards. The market economy does not price services emanating from the earth and its ecosystems (e.g., pollination, water purification, nutrient cycling, etc. ), and therefore does not value them. Such pricing is critical in order to estimate cumulative impacts on different scales and time horizons, and to assess the effect that a development will have on the integrity of ecosystem services. The latter impulse is critically important. More often than not, the rules, norms and policies of various systems thwart diffusing and scaling. This may be deliberate or the result of ignorance. Consider the food sector. Debt-based financing, private property, and export-oriented gribusinesses thwart the expansion of many innovations relevant to transition. The most admirable local alternative may be restrained or even undone by the subsidization of agribusiness conglomerates or the World Trade Organization’s support for the commodification of food. In short, changing the food system is not just a local affair. An additional factor in RESO’s success has been the role of provincial, local, and federal governments. 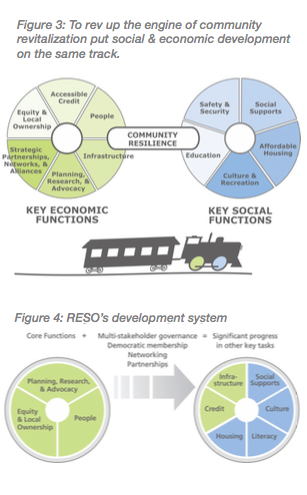 RESO won over government and other partners through its capacity to mobilize community resistance when necessary, advocate for the neighborhoods’ key priorities, and get results on the ground. It was neither a smooth process nor a short one. But, in time, RESO secured a flow of resources to support its staff and to invest in community priorities. RESO was able to further strengthen its strategic networking and partnership development within and outside its territory. In short, the state became an important partner in the ongoing process of empowering the community to achieve a range of durable results. Credit was increased; infrastructure investment was shaped to generate local benefits; literacy, housing, a range of social supports and cultural enteprises were also started and/or expanded. The leakage of capital and businesses from the community, so characteristic of the period 1960-92, came to end. Investments that help sequester carbon, conserve water, and increase soil fertility are particularly urgent. Investments that help sequester carbon, conserve water, and increase soil fertility are particularly urgent. Goal 2.1 Invest in Ecological Protection and Restoration Investments that help sequester carbon, conserve water, and increase soil fertility are particularly urgent. Goal 3: Institute basic minimum income guarantees (BIG) at the local/ regional and national levels to ensure adequate income and reduce the negative impacts of livelihoods displaced by the third industrial revolution. knock-on effect: declining global growth and slackening demand for fossil fuels. 1. ↑ United Nations, The Human Cost of Weather Related Disasters (Geneva, Switzerland: United Nations Office for Disaster Risk Reduction (UNISDR), 2015), http://www.unisdr.org/archive/46793. 2. ↑ “World Footprint: Do We Fit on the Planet?”, Global Footprint Network, accessed December 20, 2016, http://www.footprintnetwork.org/en/index.php/GFN/page/world_footprint/. 3. ↑ “World Footprint: Do We Fit on the Planet?”, Global Footprint Network; “Living Planet Report 2014: Species and Spaces, People and Places,” World Wildlife Federation, 2014, accessed December 20, 2016, http://www.footprintnetwork.org/images/article_uploads/Living_Planet_Report_2014.pdf. 4. ↑ Carl Benedikt Frey and Michael A. Osborne, The Future of Employment: How Susceptible are Jobs to Computerisation (Oxford: Oxford University Programme on the Impacts of Future Technology, 2013), http://www.oxfordmartin.ox.ac.uk/downloads/academic/The_Future_of_Employment.pdf. 5. ↑ Margrit Kennedy, Interest and Inflation Free Money (Seva International, 1995), 30-31, accessed March 29, 2016, http://userpage.fu-berlin.de/~roehrigw/kennedy/english/Interest-and-inflation-free-money.pdf. 6. ↑ Research conducted by the author for: Michael Lewis and Pat Conaty, The Resilience Imperative: Cooperative Transitions to a Steady State Economy (Gabriola, BC: New Society Publishers, 2012), 136. 7. ↑ Stewart Perry and Michael Lewis, Reinventing the Local Economy: What 10 Canadian Initiatives can Teach us about Building Creative, Inclusive & Sustainable Communities (Centre for Community Enterprise, 1994), 138-157. 8. ↑ Michael Lewis and Pat Conaty, The Resilience Imperative, 174. “Griffintown,” RESO, http://www.resomtl.com/595/griffintown.sudouestmontreal. 9. ↑ “Griffintown,” RESO, http://www.resomtl.com/595/griffintown.sudouestmontreal. 10. ↑ This section is abridged from Michael Lewis and Pat Conaty, The Resilience Imperative, 251-257. 11. ↑ “36,000 new Jobs were Created in Italian Cooperatives in 2012,” CECOP, December 6, 2012, accessed March 24, 2016, http://www.cecop.coop/36-000-new-jobs-were-created-in; Between 2007 and 2011 the number of employees increased 17.4 percent. The number of 15,000 jobs was estimated by pro-rating the percentage increase over 4 years to correspond with the 2008 number cited-13,000 jobs. 12. ↑ Policies for several countries are identified at http://www.res-legal.eu/search-by-country/denmark/. Denmark and Germany have been leaders; thus, for further detail, review each country’s profile. 13. ↑ Unless otherwise noted all material in this section is drawn from: Michael Lewis, “The Path to Fossil-Fuel-Freedom,” Centre for Community Renewal, June 18, 2012, accessed March 24, 2016, http://www.communityrenewal.ca/path-to-fossil-fuel-freedom#sthash.qjFWjXBA.dpuf. 14. ↑ Unless otherwise noted all material in this section is drawn from: Justin Ritchie, “How Germany’s State Development Bank Finances Energy Transition,” 2013, prepared for BC-Alberta Social Economy Research Alliance, http://auspace.athabascau.ca/bitstream/2149/3537/1/FTRC_EfficiencyHouseGermany.pdf. 15. ↑ “Buildings and Climate Change: Summary for Decision-Makers,” United Nations Environment Programme (UNEP), 2009, accessed March 24, 2016, http://www.unep.org/sbci/pdfs/SBCI-BCCSummary.pdf. 16. ↑ Unless otherwise noted all material in this section is drawn from: Mike Lewis, “Kirklees, UK: An Area-based Approach to Energy Efficiency, Housing Affordability, and Jobs,” Centre for Community Renewal, June 18, 2012, accessed March 24, 2016, http://communityrenewal.ca/sites/all/files/resource/i42011MAY20_KES.pdf. 17. ↑ See “Local Energy Action: EU Good Practices” (European Commission, 2004), 7-8, http://www.managenergy.net/download/gp0410.pdf; Helen Eveleigh, “The Future is Local: Empowering Communities to Improve their Neighborhoods” (Sustainable Development Commission, July 2010), http://www.sd-commission.org.uk/data/files/publications/SDC_TFiL_report_w.pdf. 18. ↑ Unless otherwise noted all material in this section is drawn from: Elizabeth Sheehan and Michelle Bonner, “En Route to Paris: From the Ground Up – How Small Businesses are Cutting Carbon and Growing the Economy,” climatesmart, accessed March 24, 2016, https://climatesmartbusiness.com/2015/10/22/en-route-to-paris-from-the-ground-up-how-small-businesses-are-cutting-carbon-and-growing-the-economy/. 19. ↑ Research conducted by the author for: Michael Lewis and Pat Conaty, The Resilience Imperative: Cooperative Transitions to a Steady State Economy (Gabriola, BC: New Society Publishers, 2012). Numbers and quotations from the author’s discussions with Seikatsu leadership and fact checked by Yvon Porier and Ian McPherson, two are experts. 21. ↑ Alex Nicholls, Rob Paton, and Jed Emerson, Social Finance (Oxford: Oxford University Press, 2015), 480. 22. ↑ Unless otherwise noted all material in this section is drawn from Maria Elena Martinez-Torres and Peter M. Rosset, “La Via Campesina: The Evolution of a Transnational Movement,” Global Policy Forum, February 8, 2010, accessed March 24, 2016, https://www.globalpolicy.org/social-and-economic-policy/world-hunger/land-ownership-and-hunger/48733-la-via-campesina-the-evolution-of-a-transnational-movement.html; See also, Peter M. Rosset, Food is Different: Why We Must Get the WTO Out of Agriculture (Halifax, Nova Scotia: Fernwood, 2006). 23. ↑ Statistics on the size and makeup of La Via Campesina come from A.A. Desmarais, “The Via Campesina: Peasants Resisting Globalization,” PhD diss., University of Calgary, Dept. of Geography, 2003. 24. ↑ See Martinez-Torres and Peter M. Rosset, “La Via Campesina,” 162. 25. ↑ “Kevin Anderson: Untold Climate Truth,” Radio Ecoshock, December 2, 2015, accessed March 28, 2016, http://www.ecoshock.org/2015/12/kevin-anderson-untold-climate-tru.html. Anderson is Professor of Energy and Climate Change at the University of Manchester and the Deputy Director of the Tyndall Centre for Climate Change Research, http://www.tyndall.ac.uk/. 26. ↑ See Richard Heinberg, “Renewable Energy After COP21: Nine Issues for Climate Leaders to Think About on the Journey Home,” Post Carbon Institute, December 14, 2015, accessed March 29, 2016, http://www.postcarbon.org/renewable-energy-after-cop21/. 27. ↑ These three points were advocated in a letter released on the eve of the Paris climate talks. The group includes four Nobel Laureates, three former US cabinet secretaries who served four Presidents (from both major political parties), two former vice-chairs of the Federal Reserve System’s board of governors, and three distinguished faculty members from Harvard University’s economics department. See “CTC’s Paris Summit Letter: A Call to Paris Climate Negotiators: Tax Carbon,” Carbon Tax Center, November 29, 2015, accessed March 29, 2016, http://www.carbontax.org/?s=Paris+letter. 28. ↑ David Coady, Ian Parry et al., “How Large Are Global Energy Subsidies?” IMF Working Paper WP/15/105, International Monetary Fund, May 2015, 3, accessed March 29, 2016, https://www.imf.org/external/pubs/ft/wp/2015/wp15105.pdf. 29. ↑ See “Time to Change the Game: Fossil Fuel Subsidies and Climate,” Overseas Development Institute, November 2013, 1, quoting International Energy Agency, partial phase-out of fossil-fuel cash subsidies would generate 12 percent of the total emissions reduction needed by 2020 to stay below the 2°C target. 30. ↑ See “Counting the Cost of Energy Subsidies: IMF Survey,” International Monetary Fund, July 17, 2015, accessed March 29, 2016, http://www.imf.org/external/pubs/ft/survey/so/2015/NEW070215A.htm. 31. ↑ Lucas Chancel and Thomas Piketty, “Carbon and Inequality: from Kyoto to Paris” Paris School of Economics, November 3, 2015, accessed March 29, 2016, http://piketty.pse.ens.fr/files/ChancelPiketty2015.pdf. 32, 33. ↑ “Agricultural Practices and Carbon Sequestration,” Union of Concerned Scientists, Fact Sheet, October 1, 2009, accessed March 29, 2016, http://www.ucsusa.org/sites/default/files/legacy/assets/documents/food_and_agriculture/ag-carbon-sequest-fact-sheet.pdf. 34. ↑ See “Carbon Sequestration Potential of Agroforestry Systems in India” Table 1 P. 2. This table provides a range, by region, of how many tons of carbon sequestration potential exists per hectare. Based on the author’s review of this table, the use of 25 metric tons/hectares is very modest. 35. ↑ This estimate is sourced to the 2000 report of the International Panel on Climate Change as reported by the Massachusetts Institutes of Technology, http://igutek.scripts.mit.edu/terrascope/?page=Agroforestry (referenced at end of the articles). 36. ↑ Environmental Protection Agency, “Greenhouse Gas Emissions from a Typical Passenger Vehicle,” February 15, 2017, 2, accessed February 15, 2017, https://www.epa.gov/sites/production/files/2016-02/documents/420f14040a.pdf. 4.7 tonnes per average vehicle/year. 38. ↑ Martin Ford, “The Robot Revolution and Jobs: ‘Humans Need Not Apply’,” econfuture, August 20, 2014, accessed March 28, 2016, https://econfuture.wordpress.com/2014/08/20/the-robot-revolution-and-jobs-humans-need-not-apply. 39. ↑ Guy Standing provides a wonderful summary of the justification and features of a Basic Income Guarantee. See his landmark book A Precariat Charter: From Denizens to Citizens (New York: Bloomsbury Academic, 2011), 316-338. 40. ↑ Glen Hodgson, “A Big Idea Whose Time Has Yet to Arrive: A Guaranteed Annual Income,” Conference Board of Canada, December 15, 2011, accessed March 28, 2016, http://www.conferenceboard.ca/economics/hot_eco_topics/default/11-12-15/a_big_idea_whose_time_has_yet_to_arrive_a_guaranteed_annual_income.aspx; Evelyn L. Forget, “The Town with No Poverty,” Canadian Public Policy 37, 3 (September 2011): 283-305. 41. ↑ “Switzerland’s Voters Reject Basic Income Plan,” BBC World News, June 5, 2016, http://www. bbc.com/news/world-europe-36454060. 42. 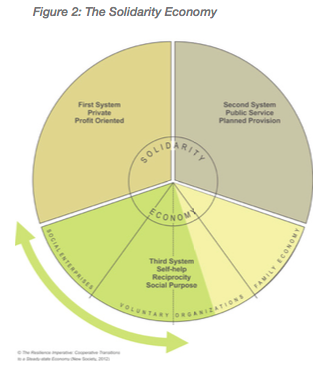 ↑ Stanislas Jourdan, “SWITZERLAND: Parliament Rejects Basic Income Initiative, but Poll Shows Popular Support,” Bien: Basic Income Earth Network, October 3, 2015, http://www.basicincome.org/news/2015/10/swiss-parliament-opposes-popular-initiative/. 43. ↑ Ben Schiller, “Kids Are Scared Of A Future Where Robots Take All Their Jobs,” co.exist, January 18, 2016, accessed March 28, 2016, http://www.fastcoexist.com/3055427/kids-are-scared-of-afuture-where-robots-take-all-their-jobs. While beyond the scope of this paper, the motivation and design of a BIG is critically important. Guy Standing examines the design features carefully as well as the arguments for and against and suggests that a BIG “be seen as basic in the sense that, without it, other rights cannot be realized,” such as those to shelter, food and education. 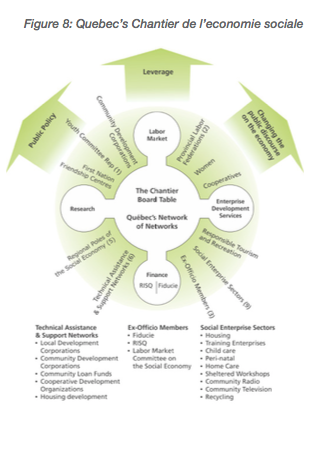 Standing, A Precariat Charter: From Denizens to Citizens. 44. ↑ M.M. Hand et al., “Renewable Energy Futures Study, Vol. 1: Exploration of High Penetration Electricity Futures,” National Renewable Energy Laboratory, 2012, 30, Appendix 1, Figure 1-4, accessed March 28, 2016, http://www.nrel.gov/docs/fy12osti/52409-1.pdf. 45. ↑ See Ian Dickie, “Financing Ecosystem Restoration in the EU,” Economics for the Environment Consultancy, 2013, accessed March 29, 2016, http://www.ceeweb.org/wp-content/uploads/2013/10/Financing-Restoration-of-Ecosystems-in-the-EU-Ian-Dickie-071013.pdf. 46. ↑ Douglas McGuire, Sven Walter et al., “Sustainable Financing for Forest and Landscape Restoration,” Food and Agriculture Organization of the United Nations and United Nations Convention to Counter Desertification (UNCCD), 2015, accessed March 29, 2016, http://www.fao.org/3/a-i5032e.pdf. 47. ↑ Such a discussion would have to cover two critical issues: 1) the speculative economy of derivatives, hedge funds, and currency trading dwarfs the world’s “real economy” (around $70 trillion in GDP); 2) the current incapacity of governments to curb the offshore banking and legal antics of multinational corporations in order to avoid taxes. This depletes governments of billions in annual revenue. 48. ↑ This has happened before. Since 1973 five major spikes in the price of oil have occurred, after which prices have fallen precipitously. Most recently, oil prices peaked at $147 a barrel in July 2008. The high price converged with the sub-prime mortgage crisis to trigger a collapse in the price of oil to below $40 a barrel. However, prices soon rebounded to $90-$100 a barrel, sufficient to establish a margin of profit in high cost, high carbon projects, like the Alberta tar sands. Other commodities also recovered and sustained high prices. So even while much of the economy languished, commodity prices were able to keep ahead of the cost of extraction. Why? The trillions in debt generated to reflate economic growth in the west plus China’s ongoing growth kept the prices high. 49. ↑ Greg Muttitt, “The Sky’s Limit: Why the Paris Climate Goals Require a Managed Decline of Fossil Fuel Production,” Oil Change International, September 22, 2016, http://priceofoil.org/2016/09/22/the-skys-limit-report/. 50. ↑ Daniel Tencer, “Mark Carney: Climate Change Threatens Financial System, Oil Could Be ‘Stranded’ Asset,’” Huffington Post, September 30, 2015, http://www.huffingtonpost.ca/2015/09/30/markcarney-climate-change_n_8222008.html. 51. ↑ Most people are under the delusion that the deposits of other bank customers are the basis for lending and that the role of the banks is that of an intermediary. Josiah Stamp, Director of the Bank of England, one of many who has tried to set the record straight, put it this way in 1927: The modern banking system manufactures money out of nothing. The process is perhaps the most astounding piece of sleight-of-hand that was ever invented. Banking was conceived in inequity and born in sin. Bankers own the earth; take it away from them, but leave them the power to create credit, and with the stroke of a pen they will create enough money to buy it back again…If you want to be slaves of the bankers and pay the cost of your own slavery, then let bankers continue to create money and control credit. 52. ↑ Kennedy, “Interest and Inflation Free Money,” 8. 53. ↑ Kennedy, “Interest and Inflation Free Money,” 8-9. 54. ↑ For example, consider the minimum investment required for one climate adaptation measure in Vancouver, British Columbia. Metropolitan Vancouver has an extensive dike system to protect low-lying areas from inundation. The 2007 Panel on Climate Change estimated that the sea level will rise one meter by 2100. The engineering and related costs of upgrading the dike system to protect against that rise were estimated to be $9.5 billion in 2012. Given most recent evidence of the likely sea-level rise, that estimate may well be conservative. Yet local and regional governments in Canada are limited to taxing property and levying user fees. This makes Vancouver virtually impotent to undertake such a project, no matter how urgent it is. Even with the major share of Canadian taxation (92 percent), senior governments are also constrained and will become more so by low growth, or still worse, if deflation were to set in. 55. ↑ Les Whittington, “Rocco Galati in Court to Challenge how Bank of Canada Does Business,” Thestar.com, March 23, 2015, accessed March 29, 2016, http://www.thestar.com/news/canada/2015/03/23/rocco-galati-in-court-to-challenge-how-bank-of-canada-does-business.html. 56. ↑ Ambrose Evans-Pritchard, “Jeremy Corbyn’s QE for the People is Exactly What the World May Soon Need,” The Telegraph, September 16, 2015, accessed March 29, 2016, http://www.telegraph.co.uk/finance/economics/11869701/Jeremy-Corbyns-QE-for-the-people-is-exactly-what-theworld-may-soon-need.html. Michael T. Lewis is well known in Canada and internationally as a practitioner, author, educator, and leader in the eld of community economic development and the social economy. His experience cuts across the full range of functions connected to community renewal and development. He has built and advised a wide range of businesses, organizations, and governments all over Canada and internationally as well. An innovator, activist and thinker with a penchant for linking practice with policy and the micro and macro, Mike’s leadership in Canadian Centre for Community Renewal and elsewhere continues to help connect the dots and stay ahead of the curve.